At New Life Furniture we never “dip” the furniture in a hot caustic solution. Dipping is very destructive to the integrity of the piece, it will literally unglue the entire piece and make the wood unstable. Hand stripping is room temperature, pH neutral, and is never submerged in boiling hot lye. Hand stripping is the way to go for furniture. Furniture manufacturers produce many different specific types of finishes. Finishes can be period to a specific time in keeping with an antique restoration or a very durable hard conference table top finish which would be inappropriate to a restoration job. Specialty finishes can also be a painted finish in a very specific color, sheen, and nuance. New Life Furniture can execute most all finishes. Sometimes furniture just needs some preventative maintenance before it gets to the point of needing an entire refinishing job. Touch-ups or refurbishing the existing finish is a good alternative, especially when the overall look of the piece is good. Tops of furniture normally take the majority of the wear and tear while the sides and front still look good. If you have white rings from drink glasses or burns or black marks, there is no need to discard a perfectly good piece of furniture when all that is needed is to refinish the top. Furniture can be subjected to many different elements: perhaps a dresser side has been sun-faded from being next to a window; pets can chew and claw a lower portion of a case piece or table leg. New Life Furniture can even refinish a single drawer face to match the existing non-damaged drawers. Furniture makers have used veneer on furniture for hundreds of years. It is a method of displaying highly figured wood grain on a piece of furniture. There is nothing bad or negative about owning a veneer piece of furniture. Occasionally a veneer repair is needed whether it has a lifting problem or a chipping/missing area. New Life Furniture can make a professional repair. Drawers and doors open and close thousands of times and eventually areas start to wear at their point of contact. Depending on the age and type of construction of your pieces that need drawer work, New Life Furniture can repair/replicate a period correct repair for worn drawers and tracks. As styles change, a piece of furniture can be transformed by changing the color or type of finishing. New Life Furniture can reconfigure the design and functionality of the piece. We have altered and reconfigured many pieces at our shop. Give your home a stunning, new look with furniture refinishing services from New Life Furniture Systems in Wilmington, Delaware. With more than 50 years of industry experience, we have the industry knowledge and expertise to assist you. In addition to refinishing, our company provides refurbishing services you can count on. Trust our experts to revamp your furniture. Pickup and delivery are available. Hardware is included in all of our refinishing and refurbishing services, along with hardware polishing. We guarantee our workmanship, and we are confident in our detailed work. 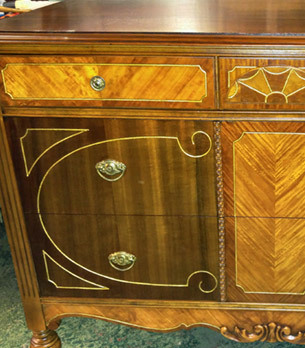 Refurbishing the original finish to a piece of furniture can be a very good choice to direct a restoration project. A lot of times when a piece of furniture gets older and has been taken care of well, it gets a charming patina that only comes with age. It is a nuance that cannot be duplicated by refinishing, so a wonderful way to maintain a piece such as this is to clean and dewax the piece, and then perform hand touch-ups on any blemishes. After a thorough cleaning, deglossing, and touch-up, the piece can rejuvenated with a top coat that will provide protection for many years. with furniture repair from our professionals.